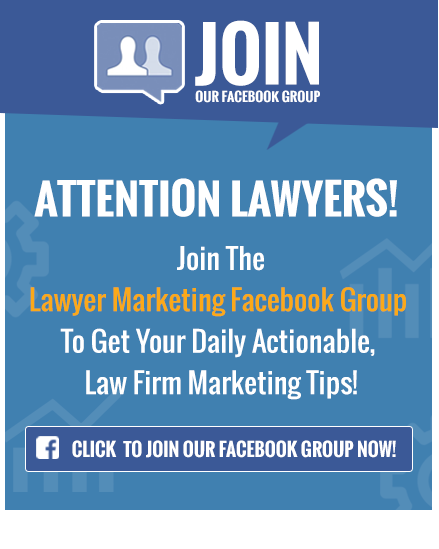 Right now, marketing on Facebook is one of the most effective ways for any law firm to begin generating solid leads that will turn into paying clients. However, successful marketing on Facebook doesn’t mean running ads that sell your services. 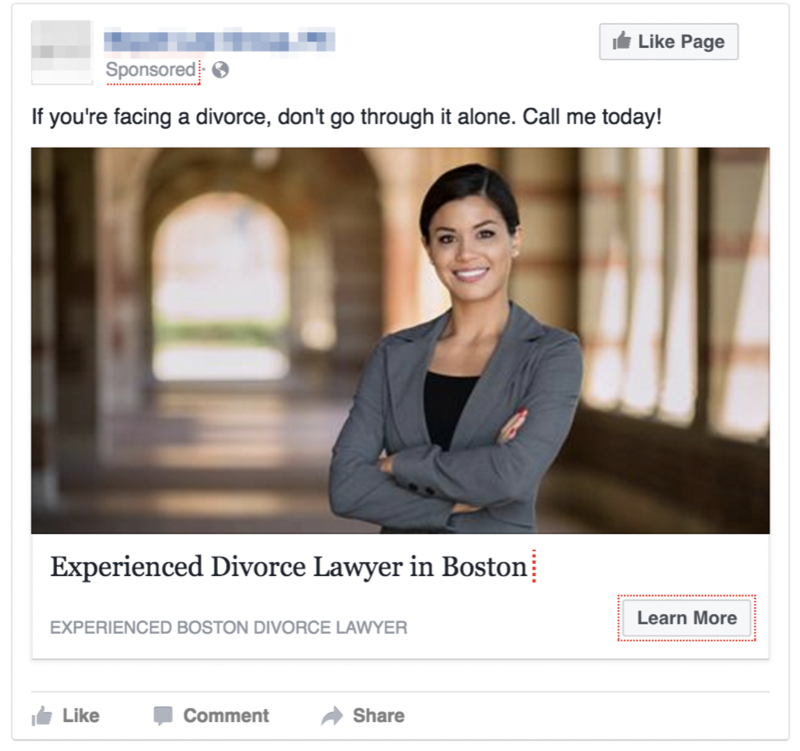 Ads on Facebook that sell services are not effective because no one cares. People don’t go to Facebook to buy – they go to Facebook to be entertained. They want to see what their friends and family are up to. They want to see the latest viral video. They want to look at cute cat memes. Your firm’s ad selling legal services can’t compete with Taylor Swift and a basket full of kittens. 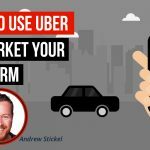 So, instead of marketing your services, what you should do is market your content, specifically a blog post. When you market your content, you’re not advertising. Instead, you’re educating and entertaining your target audience, while making yourself the authority in your field. By taking this approach, you’re giving the people what they want to see on Facebook. That’s why this kind of Facebook marketing, also known as “content” or “education” marketing, works exceptionally well. Many more people will click on an interesting blog post than would ever click on an actual ad. 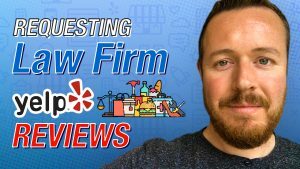 Once they read the post, they not only get introduced to your brand, but they also begin to develop trust in your firm’s expertise and view you as an authority in the field. That’s the essence of content marketing – target an audience and begin to build trust and authority with them. It’s also why content marketing works. Consumers very rarely make a purchase the first time they encounter a brand. Before the Internet, a potential customer had to come in contact with a brand at least three times on average before they made a purchase. Today, that number has increased to approximately nine times. When you market your content, you give your target audience the contact with your brand that they need to build trust so that they feel comfortable going ahead and hiring your firm for their needs. Let’s take a closer look at how the process works. Obviously, you need content, preferably a blog post. 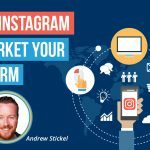 You want to make this content as engaging as possible. Use lists. People love lists. They’re easy to scan, so readers can get the information they need quickly. Use an intriguing title. More often than not, it’s the title of your content that grabs a reader’s attention and makes them curious to learn more. 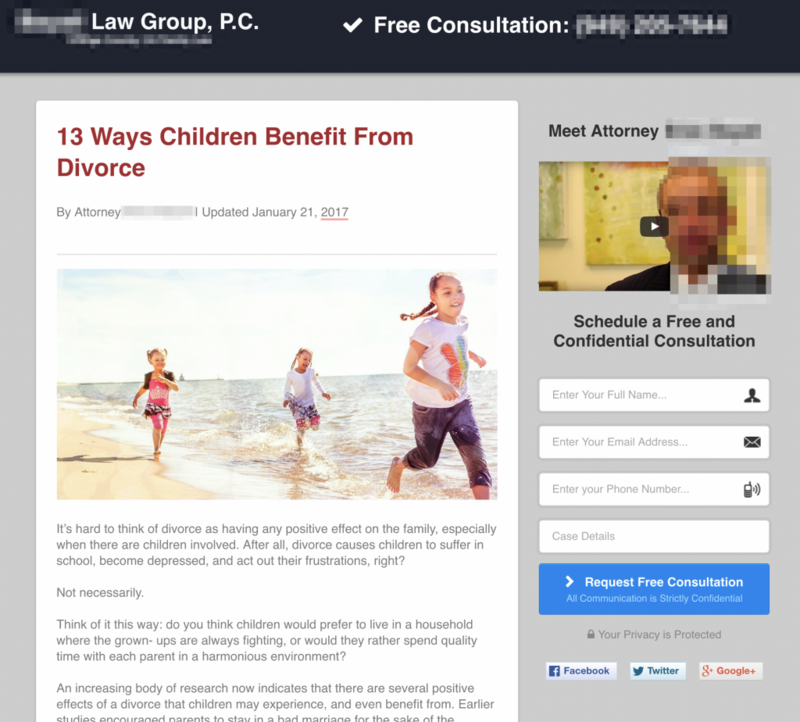 For example, “13 Ways Children Benefit From Divorce” would be a perfect way to grab the attention of a family law attorney’s audience. Keep it as short as possible. Remember, you’re trying to engage and entertain. Long articles that require a lot of scrolling to read tend to kill engagement. Use text spacing. Many lawyers make the mistake of writing a 400 or 500 word article using two or three mammoth paragraphs. Nobody is going to read that. You have to break up your text if you want people to read it. For instance, take a look at the spacing of this blog post. Perhaps one of the most important decisions you can make is the topic of the content. 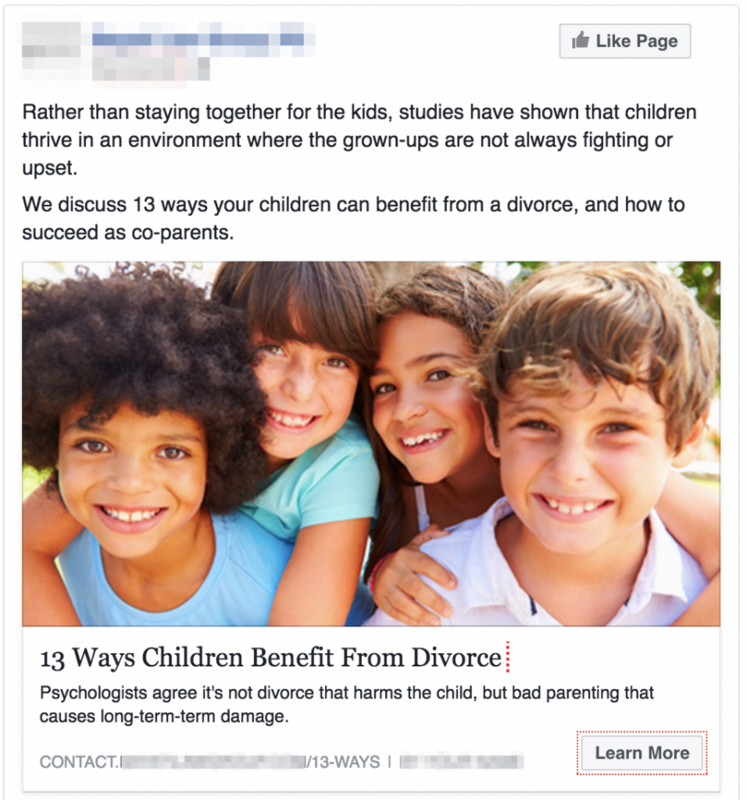 The reason the “13 Ways…” topic is good is because it is appealing to the exact audience that we’re attempting to target: parents considering a divorce. Initially, we used a piece of content entitled “11 Ways to Help Your Children Cope With Divorce,” but it fell flat. The reason “11 Ways…” didn’t work as well was because it appealed to too wide of an audience. Your divorce could have been finalized six months ago and the “11 Ways…” blog post would still be applicable to you, but the “13 Ways…” post captures people when they are still weighing the pros and cons of the divorce. These people are much more likely to need a lawyer in the future. Once you’ve created your content, you want to create a custom landing page for that content. We use Click Funnels to build landing pages for our clients because it’s fast and easy to setup. Whatever you use, you want to make the landing page look very similar to a blog page as opposed to a marketing squeeze page. 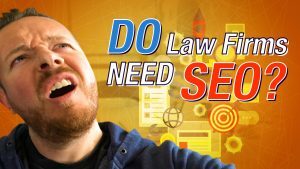 Besides the article, make sure that the page contains high-quality images that relate to the content, as well as attorney bio information, social proof and calls to action. You’ll also want to customize the landing page so that it matches your firm’s logo and branding. Make sure that your page contains the code for the Facebook Pixel, which allows Facebook to log and track the individual Facebook users that clicked on your page so that you can continue to market to them. Finally, and most importantly, you want to make sure that the page loads quickly once people click on it. A large portion of traffic on Facebook is mainly mobile traffic, so if your page lags and doesn’t load quickly, people will hit the back button and be gone forever. If your page is in the red, you need to speed it up. Once you’ve got your content set up on your landing page, it’s time to create the ad that you’ll run on Facebook to generate traffic. First of all, your ad should have an eye-catching title that will grab the attention of your target audience. 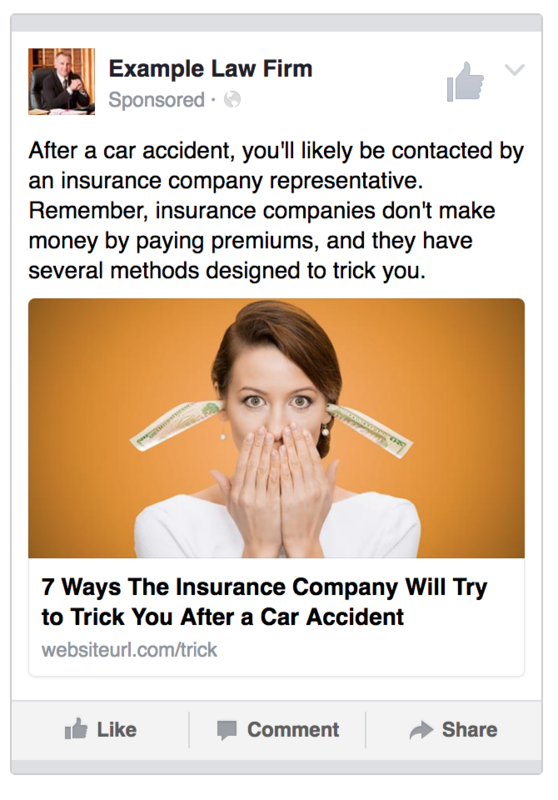 For example, a personal injury attorney from San Diego promoting a blog post entitled “You’ve Been in a Car Accident – Now What?” might want to use the title “7 Ways The Insurance Company Will Try to Trick You After a Car Accident” in his Facebook ad. 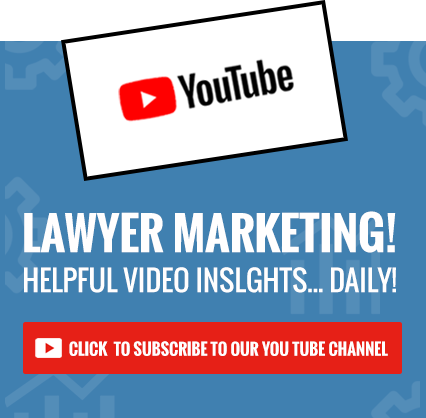 That title is catchy and it calls out to the exact audience that the PI attorney is trying to reach – accident victims in San Diego – and creates a sense of urgency. 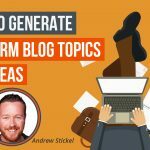 Follow the title with a short descriptive sentence that tells a viewer what the blog post is about. Our PI attorney might follow his title by saying “After a car accident, you’ll likely be contacted by an insurance company representative. 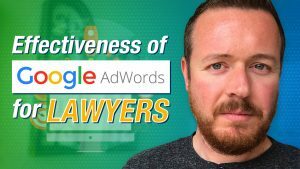 Finally, you want to use a high-quality, colorful image in your ad that relates to the subject of the blog post that you’re promoting. Lastly, it is important to create several ads, each with a different image. Make sure the images are very different and contrast one another. Facebook will automatically optimize the ad that users respond to the most. When this happens, you’ll notice the “reach” of one ad will be much higher than the others. At this point, pause the other ads and only run the ad that Facebook has determined to be the winner. Let me start by saying that Facebook knows a lot about you. They know how much money you make, how many kids you have, where you shop for groceries and much, MUCH more. 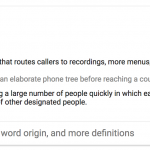 Facebook also uses your website browsing data, and every time you visit a website that has either a Facebook pixel installed, or a Facebook “Like” button, you’re being tracked. As creepy as this may be, it also means that Facebook allows you to target the exact niche audience that you want to target. 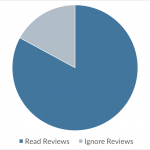 When combining a narrow audience with content marketing, the results are awesome. Going back to our example, the audience that the lawyer in question is targeting are car accident victims in San Diego. As you continue to test your audiences, you’ll start to identify which audiences provide the most clicks and leads. Schedule ads to start at midnight the following day so Facebook optimizes the ad to accurately spend your entire daily budget. Allow ads to run for 48-72 hours to determine winners and losers. The Facebook Pixel is extremely powerful, and it allows you to track every user that has been to your website and landing page. Using this data, you can tell Facebook to optimize your audience so that your ads only display to people that are likely to click on your ad. 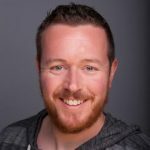 This conversion optimization is based on past data, so it gets stronger the longer the campaign runs, which means that as the campaign progresses, it becomes more efficient. One of the other benefits of Facebook Advertising is that it can deliver instant results, allowing you to react quickly to events as they happen in real time. For example, one of my clients is a personal injury firm in New York City. 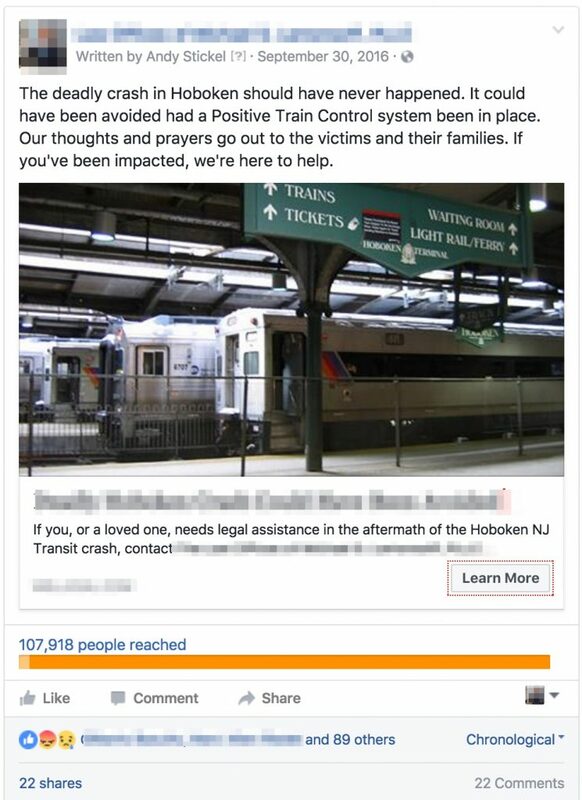 Recently there was a commuter train accident in Hoboken, NJ, not far from where the firm is located. I told them to write a quick article from a personal viewpoint about the accident. 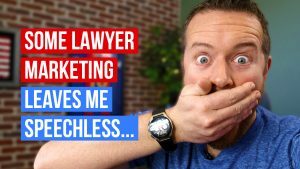 I didn’t want a sales pitch – instead, I wanted something that offered an opinion from the attorney on the accident. 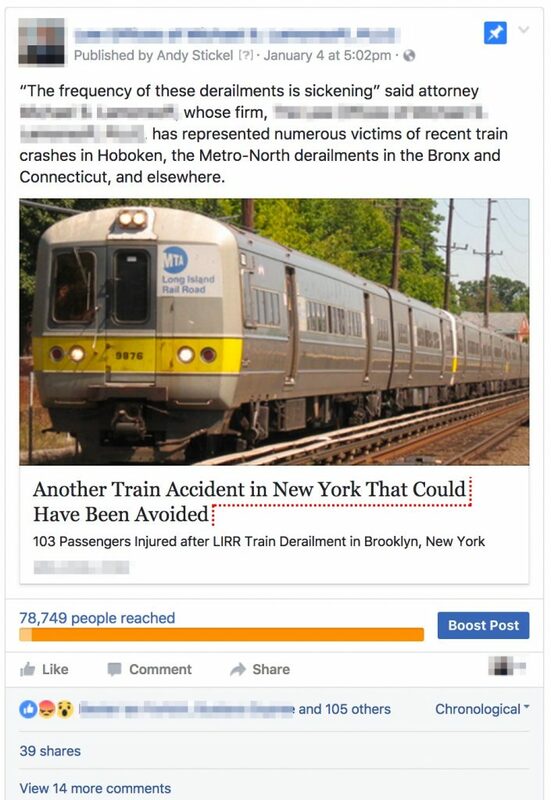 Within an hour I had an article about how the accident could have been prevented if the train had been equipped with a certain type of fail-safe mechanism. The article was a well-written and passionate piece about how unnecessary the injuries and loss of life caused by this accident were. I quickly put together a landing page for the article and a Facebook ad that simply targeted men and women over 30 years of age within a 50-mile radius of the city in question. We had the ad up and running within 3 hours of the accident with a $250 daily budget. We were literally sending it to almost every adult man and woman in the area, and that wide net paid off. 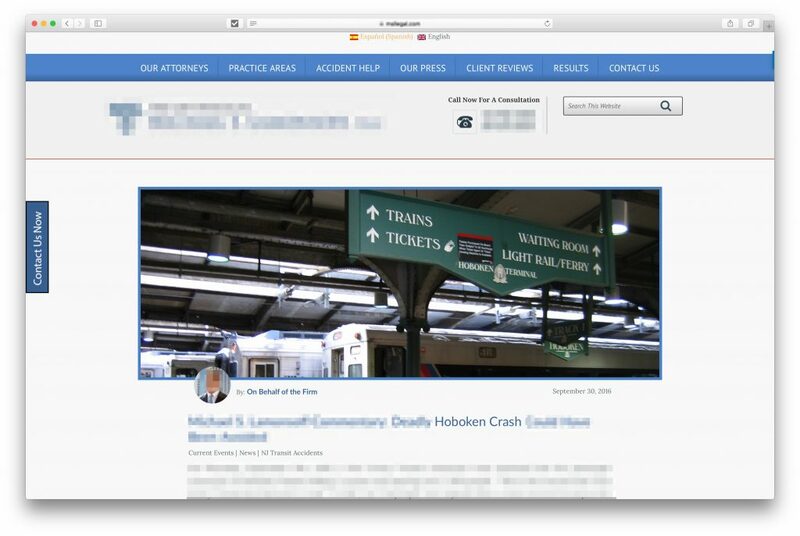 Within hours, the firm received a lead from a family member of a crash victim, who has since become a client. 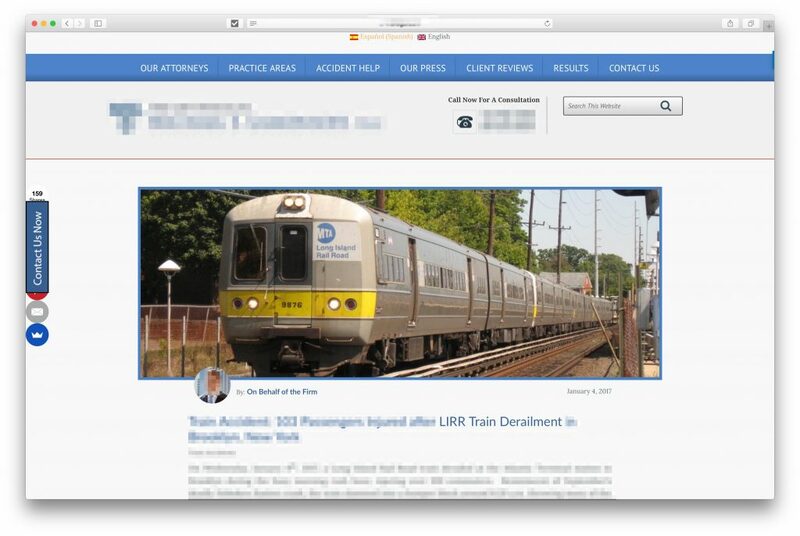 We used the exact same method when a train crashed in Long Island a few months later, which resulted in a client from that accident as well. Right now, Facebook is a wide open and you need to take advantage of it before your competition does. The inexpensive ads, combined with their large reach and demographic database makes using content marketing on Facebook to reach your audience a no brainer. 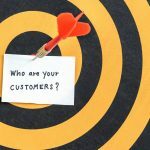 Do you have questions about your Facebook ads? Shoot me an email: [email protected].